Verify: Is Starbucks actually using more plastic to get rid of straws? A post gaining a lot of attention online claims the new Starbucks lids use more plastic than the old lid/straw combo. As Starbucks cuts out plastic straws are they actually using more plastic to do it? Multiple viewers asked about a post from the page “Unbiased America” on Facebook. The photo claimed that “ENVIRONMENTAL ACTIVISTS APPLAUD STARBUCKS’ NEW STRAWLESS LIDS!!! So is that claim true? Yes. 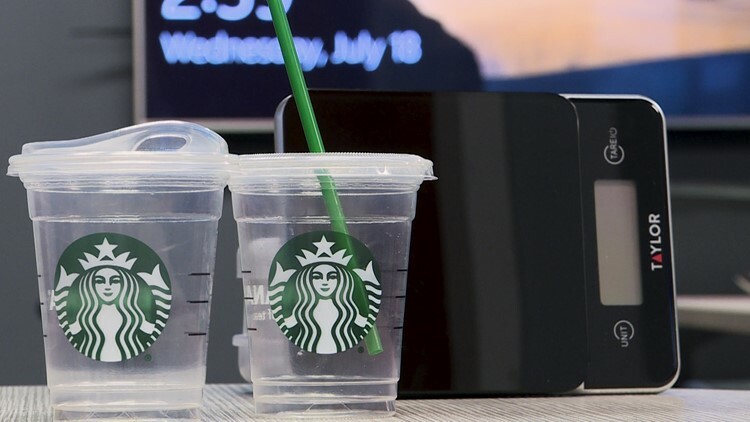 Our own tests showed different measurements than others listed online, but the end results were the same: the new Starbucks lids do have more plastic than the previous lid and straw combos. But, experts say the new lids are still better for the environment. Starbucks announced their plan to remove straws on July 9. Their announcement, “Straws are out, lids are in,” detailed their plan to remove all plastic straws from their retail stores by the end of 2020. The “Unbiased America” post cited numbers originally posted on the website Reason.com. 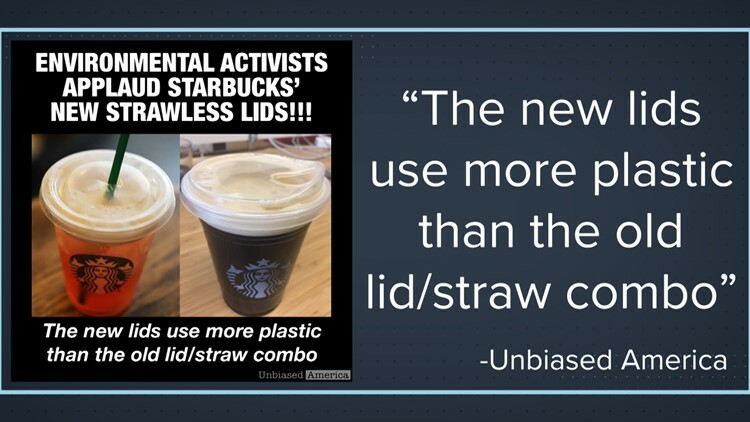 Multiple viewers sent in a post from the 'Unbiased America' page on Faceboo that claimed Starbucks' new strawless lids actually use more plastic than the old lid and straw combination. Verify’s Jason Puckett ran his own version of the tests. Each type of lid was weighed 20 times on two different scales. The numbers were then averaged. His results showed an average weight of 1.35 for the old lid and small straw combo and 1.95 grams for the old lid and big straw. The new lid averaged a weight of 2.55 grams across testing. While the numbers varied between the Verify test and the one posted by Reason.com the end result was the same: The new lids do weigh more. So does this mean that Starbucks actually defeated their purpose? To Bonnie Monteleone, the Executive Director of the Plastic Ocean Project, the move by Starbucks was still meaningful. Monteleone said that the move from two separate items - a lid and straw - to a single lid also helps. Monteleone said compared to a straw, a larger lid is also less likely to enter a body of water like the ocean, and if they did, they’d also take longer to break down. “The longer longevity they have, the greater opportunity of collecting it and the less possibility of it breaking down into smaller pieces,” she explained. Yes, Starbucks' new lids do use more plastic than the straw and lid combo they’ll replace. But no, that doesn't mean they’re worse for the environment.